I was at preschool this morning for one more subbing shift. That’s my excuse for the later-than-usual verse post. I also waited until afternoon before posting because I wanted to make sure I had time to write on my chalkboard and take a picture. Priorities. It’s kind of funny that the song for this passage is so upbeat, because the words can be hard to swallow. But obviously the song is geared toward younger ears, thus the emphasis on the “follow me” part, which I think is appropriate. But those who are a little older and maturing in our faith will find ourselves confronted with some hard truths in this passage. Denying ourselves, suffering, following someone else, and losing our lives are not things we like to do or things that are celebrated by most people. Some of these things we might be okay with doing a little bit sometimes, but Jesus says we “must” do them, and he doesn’t leave much wiggle room. This verse tells us exactly how to follow. Jesus tells us what to do and that it is very important. And while he is concise in his instructions, it does take a person some time to understand the fullness of the meaning and learn how to live it out. I’m still trying to figure it out, which is why I don’t feel super comfortable pinpointing here what the exact, practical applications are. What I do know is that I need to obey, and follow to the best of my current ability and understanding. I need to seek God’s wisdom and grace so that ability and understanding will increase as I go. For me right now, this passage is a continuation of what I learned from Matthew 6:20-21 about holding my possessions loosely. I now have to take it even further, not only holding my possessions, but my very life with a loose grip so I can give God the honor and authority he deserves. Today I am reminded that my self-protecting, fearful desire for comfort is not conducive to Jesus’ instructions for his followers. This is one more thing I am to give up in favor of a closer walk with the one I claim to follow. What might that mean? Probably giving up some time. Some convenience. Some preference or pride. I know it definitely means continuing to allow the Spirit to train my mind to think of others before I think of myself. Here are some references that helped my understanding today, and may help you. I’m just pasting the links I had open in my browser as I wrote this post. 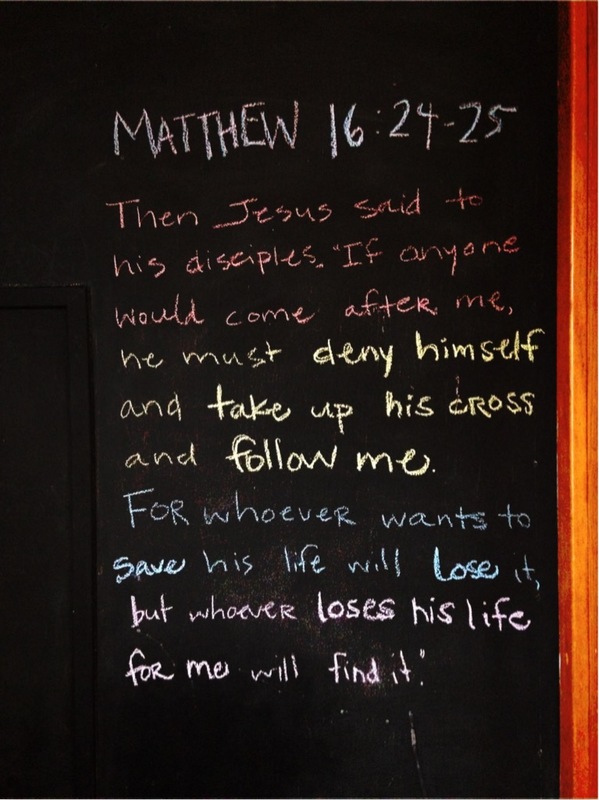 What does Matthew 16:24-25 mean to you?